This holiday home is part of a complex located in the close vicinity of no less than three golf courses; Las Ramblas, Villamartin, Real club of Golf Campoamor.The building including this property are built in a traditional Spanish style with white-washed walls and colourful tiles.Inside the house has been renovated to a good standard and furnished with rather basic items. The house is however perfectly comfortable for one or two weeks holiday. There are two bedrooms that one with double bed the other with two single beds and one spacious family bathroom.Guests will be able to use the communal facilities of the complex at will including the lovely free-form swimming pool. This beautiful modern villa was recently built in 2006. The agent has rated it as a four star property so it is a well-equipped villa with above average furnishings. It is also great value for money. 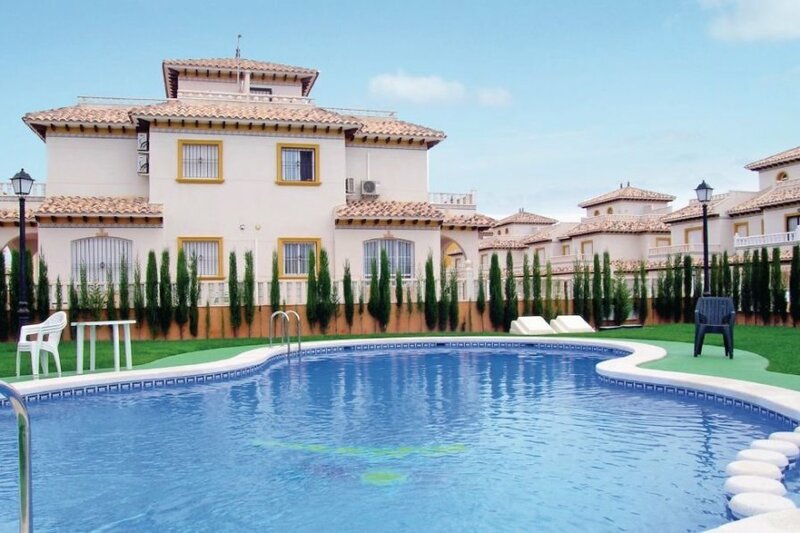 This villa has use of a shared pool and is located in La Cuerda y Lomas de Cabo Roig, only 15km from Torrevieja. It is set in a convenient location, 2km away from a sandy beach. There's also a restaurant only 300 metres away. You can also park on-site at no extra charge. The villa is well equipped: it has a refrigerator, microwave with oven, washing machine and dishwasher. It also has a garden and some garden furniture outside.